Lilian Chen: Design Innovator Finding New Success! It is such a thrill to watch a friend experience long-sought success...especially someone so deserving. 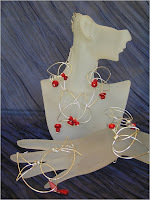 I first met Lilian when I signed up for one of her classes at the Pasadena Bead & Design Show over a year ago. Lilian taught interesting wire design and innovative cold connection techniques. I was transfixed and ended up taking a few additional private lessons from her as well. In the process, we became friends and supporters of each other's work. 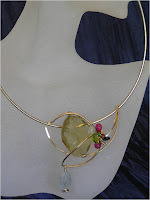 Lilian makes such gorgeous pieces but she doesn't sell any of it! Seems funny to me, but Lilian much prefers to teach than to sell what she makes. She teaches at several bead stores in the Southern California area including You & Me Findings, Aubrey's Beads and Bead Source, but her goal has been to be accepted as an instructor at the major trade shows and she made a huge step in that direction this past week when she learned that she was accepted as a Swarovski instructor at The Tucson Bead Show under their CREATE YOUR STYLE IN TUCSON 2009 program and she will be teaching four classes at the Bead&Button Show . 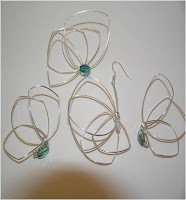 Lilian is a self-taught designer whose work has been featured in several bead magazines. 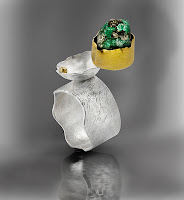 She works mainly in base metals and colorful beads; making the design rather than the materials the show-stopping effect of her pieces. My hat is off to Lilian! Much more success is surely coming for this remarkable talent. 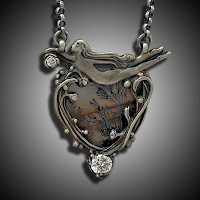 Holly Gage specializes in creating gorgeous Precious Metal Clay (PMC) jewelry--and teaching/writing about PMC techniques. 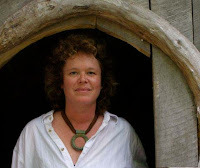 I first saw her work on the Ganoksin Gallery website but Holly is also a regular contributor to the Orchid forum where so many opinions and jewelry making information are freely shared. And, by the way, if you don't already subscribe (free) to Orchid, sign up immediately! It's a fascinating, inside look into the world of jewelers who are daily confronting the technical and business challenges of our times. 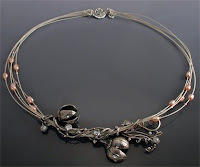 Precious Metal Clay is a little more than 10 years old and there is so much to be explored and learned. 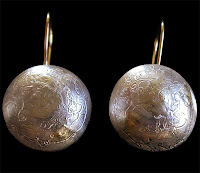 My non-traditional way of looking at things has been an asset in working with metal clay because I am always asking "what if?". I've developed a couple of new techniques that have been springboard ideas for new directions in the medium and I find that very exciting. You mention that you like to enlarge small details in your work...tell us about this. I like to explore the forms of everyday things. When I abstract them, I take something real and accentuate it allowing people to look at it in new ways. I think it is neat to take the viewer right into the symmetry of a form, its folds, shadows and colors that one might not notice unless an outside person pointed it out to them -- that person is me. Just like the many sides to your personality, there are several styles of art that I like to work in. I have my "Botanical" collection, which explores my immediate environment and experiences. My husband selects and grows plants that he thinks I'd like to draw, photograph and then sculpt into jewelry. This is a line that allows me to express myself in a more poetic form. The process of carving is slow and meticulous, but very satisfying. While working on it, I am reminded to appreciate the little things in life, such as the small flowers that appear before the peas arrive in the garden or the sound of the outdoors when my eyes are closed, or the warmth of my husband's arm around me when stealing three minutes on our hammock. They are small slices of life, but nevertheless important. 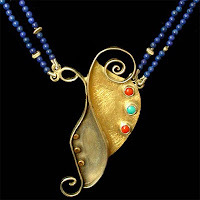 The other line of jewelry I have is the "Metal Clay and Rainbow Titanium" line. There is an interesting energy that bubbles up when I work with it -- it is hard to explain, but ideas fly and I often have several pieces going at the same time. My Titanium has a fabulous sculptural quality. 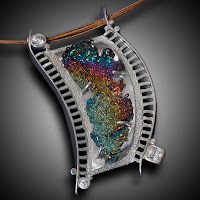 This rare form of Titanium has an amazing play of light on the crystalline surface with saturated and subtle hues of color. Because it is named after the Greek Gods for its mighty strength, I often play off this theme in my jewelry designs to empower and celebrate the strength of the human spirit. You seem to have a thriving side business selling components, beads etc...what do you enjoy about this aspect of your business? I like to make components that are elegant and something you can't get elsewhere. The pressed bead caps for example came about because I was making a lot of lentil lampwork beads, but there were no caps that I could find on the market that could fit the narrow profile, so pressed bead caps were born. The sole companions came about as a, “what if?” idea. 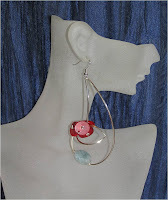 I love to collect artisan beads and I just thought the idea of combining glass and the metal clay seemed very natural. Well, the look was neat, but the process is a bit more involved -- certainly some trial and error initially, but the results can be very eye catching.However, in general I like to provide the market with items that are new, unique and different. It’s a thrill when someone sends me a picture for my “Customer Gallery” of his or her finished creations. You seem to thrive on the teaching aspect of this work, with numerous entries to the Orchid forum, your web site filled with tutorials and student work and the classes...what about teaching is special for you? I like the idea of helping others express themselves through their art. I know it has been very freeing for me to find my inner voice. Through my art, I speak in a language that comes easier to me than the written or spoken word. I also know that there is a drive for creative people to express themselves. I'm afraid if they deny this inner need, then they find something is missing in their lives. Usually they cannot figure out what is missing until they find their comfort zone and create with a medium that lets it all flow. You can actually see it in a student's face when they arrive in that really neat place, and this is the gift my students give back to me. 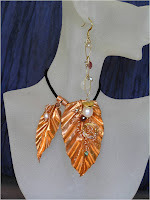 Well, there certainly is a different pace when you make jewelry for your living verses a hobby. I'm not a particularly fast worker and I need to kick the "little devil" off my shoulder -- my conscience that nags me constantly about working too slow. I needed to figure out a way that I can enjoy my slow carving work without worrying about the clock. When I came up with a line of casted items, that allowed me to work as long and slow as I'd like on carving the prototype without worrying so much about the clock. It also allowed me to have a lower cost line of jewelry, freeing me up to create involved one-of-a-kind pieces, which is my real joy. Be passionate, be persistent, and be stubborn about your own success. 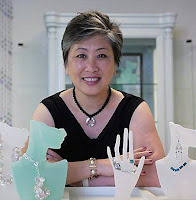 In my other life before going full time into jewelry designing, I was surprised to seize a big account with my graphic design and publishing business. My attitude was to pursue this client even though in the back of my mind, I really didn't think that I would actually get the account. I went for it, putting my best foot forward. I guess they saw something in me and my work and I ended up having a successful 10-year relationship with this customer. It taught me not to shut the door in my own face ever again. Obviously, it is uncomfortable to face rejection, however cutting short your own opportunities by not trying is the worst thing you can do to yourself. I think having a plan is a great idea too. I know the words, "Business Plan" make people want to run in the other direction, however there is a lot of validity that comes with "writing your plan down" It forces you to think about the intricacies of what you need to do, not just the overall picture. It will also create a sturdier foundation. As a creative artist, it is easy to go into many directions, but a plan will keep you focused on just one. I have tremendous respect for what Holly has been able to accomplish! 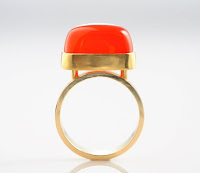 Her work is amazing and her website is one of the most sophisticated and content-filled of any I've seen from jewelry artists....must be that graphic designer still lurking within Holly! 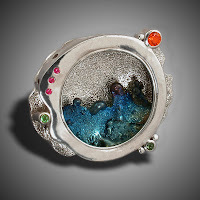 Holly's next show is coming right up at the 12th Annual Craft and Art Festival at the Nassau County Museum of Art Oct 11 - 13 Sat., 11 - 6, Sun., 10 - 6, Mon., 10 - 6 Booth 215 and her work is in shops from New Jersey to California and many states in between. 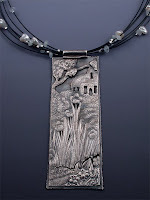 Holly has also published numerous pieces on PMC, most recently a self-published calendar, The Art and Design of Metal Clay Jewelry and More 2009.